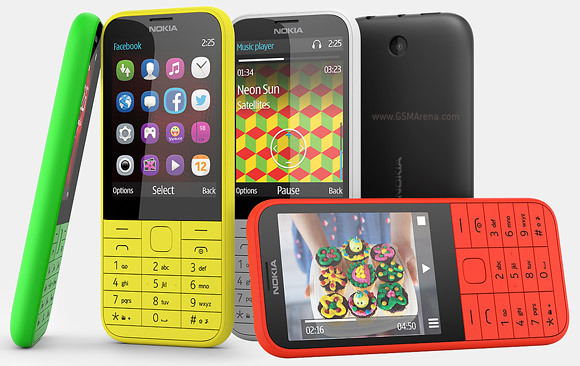 Nokia just announced the 225 – a Series 30+ feature phone that will go on sale at an estimated price of €40. There will be a dual-SIM version too, both will start shipping in select markets within three months. The Nokia 225 features the biggest non-touchscreen Nokia has put on a feature phone – 2.8" in diagonal with QVGA resolution. It's one of the thinner Nokia phones too at 10.4mm, and weighs 100g. The phone comes preloaded with compression-enabled Nokia Xpress Browser for lower data usage and quicker load times. It also has Facebook, Twitter and Bing search preinstalled. The Nokia 225 has a microSD slot that supports 32GB cards and can serve as an MP3 player with a 103 phon speaker. There's FM radio with RDS too. The phone packs a 2MP camera with QVGA @ 15fps video capture, Bluetooth 3.0 with SLAM (a file sharing solution that emulates NFC). As a feature phone it offers great battery life – 36 days of standby (27 days for the dual-SIM), 21 hours of talk time and up to 49 hours of music playback. The Nokia 225 will come in Red, Yellow, Green, Black and White. I am using there whatsapp and talk to friend.